There are many factors involved in conducting biometric screening, such as privacy, scheduling, and staffing. 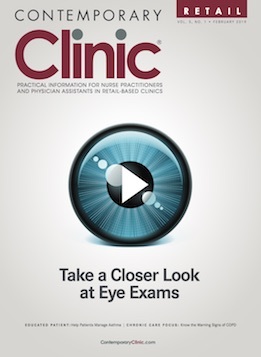 Most vendors have a minimum number of participants that they require to provide an onsite event, which can make it challenging for smaller offices.2 Options for employees working off site and smaller offices include at-home self-collection kits, individual screenings at the home or office, physician kits, and screenings at clinical-reference laboratories or urgent care centers. Advertise the screening events through email blasts and flyers to increase participation. Fasting screenings should be conducted at the beginning of employees’ shifts, and refreshments should be provided afterward. Appropriate space for the screening is important, with adequate privacy and staffing for discussing the results. During these screenings, blood can be drawn either by a finger stick and tested immediately with a point-of-care blood testing device or through a venous blood draw sent to a laboratory for testing.2 Keep in mind that normal value ranges for results can vary based on the lab and the patient’s medical history. 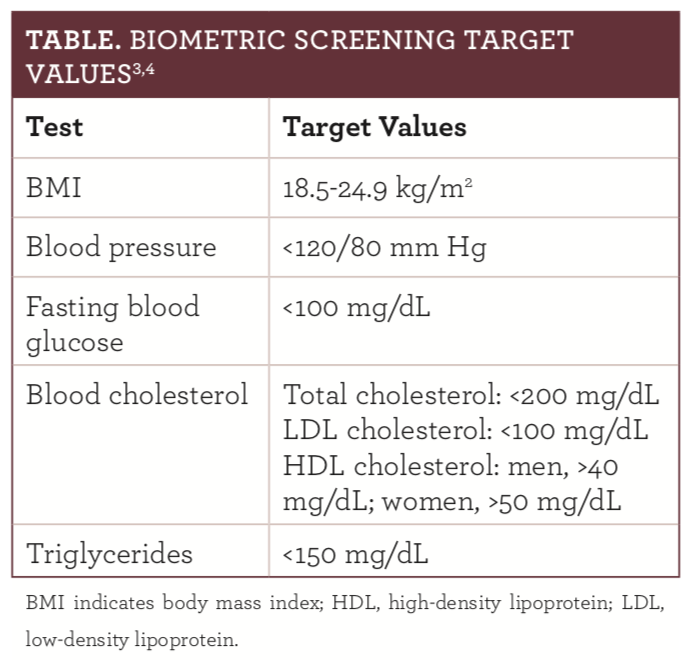 Health care professionals involved in biometric screenings should be up to date on current goals (Table). For example, updated guidelines for detecting high blood pressure lowered the range of stage 1 hypertension to a systolic blood pressure of 130 to139 mm Hg or a diastolic blood pressure of 80 to 89 mm Hg.3 Patients with elevated test values should be counseled on lifestyle modifications, such as diet and exercise, and be referred to a physician for an evaluation. It is also important to keep in mind that the target values should be individualized for patients with medical conditions. Results should be discussed with employees and sent with permission to their physician issued as a referral recommendation for those without a health care provider. Employees should receive copies of all results. Pharmacists and other health care professionals can play an important role in monitoring patients as part of an interdisciplinary team. CDC. Workplace health glossary. CDC website. cdc.gov/workplacehealthpromotion/tools-resources/glossary/glossary.html. Updated February 1, 2018. Accessed June 10, 2018. Biometric health screening for employers: consensus statement of the health enhancement research organization, American College of Occupational and Environmental Medicine, and care continuum alliance. J Occup Environ Med. 2013;55(10):1244- 1251. doi: 10.1097/JOM.0b013e3182a7e975. Whelton PK, Carey RM, Aronow WS, et al. 2017 ACC/AHA/AAPA/ABC/ ACPM/AGS/APhA/ASH/ASPC/NMA/PCNA guideline for the prevention, detection, evaluation, and management of high blood pressure in adults: a report of the American College of Cardiology/American Heart Association Task Force on Clinical Practice Guidelines. J Am Coll Cardiol. 2018;71(19):e127-e248. doi: 10.1016/j. jacc.2017.11.006. American Heart Association. Body mass index in adults (BMI calculator for adults). American Heart Association website. heart.org/HEARTORG/HealthyLiving/ WeightManagement/BodyMassIndex/Body-Mass-Index-In-Adults-BMI-Calculator-for-Adults_UCM_307849_Article.jsp#.WyHeJopJnIU. Updated August 2014. Accessed June 13, 2018. Brown-Connolly NE, Concha JB, English J. Mobile health is worth it! Economic benefit and impact on health of a population-based mobile screening program in New Mexico. Telemed J E Health. 2014;20(1):18-23. doi: 10.1089/tmj.2013.0080. Maeng DD, Geng Z, Marshall WM, Hess AL, Tomcavage JF. An analysis of a biometric screening and premium incentive-based employee wellness program: enroll- ment patterns, cost, and outcome [published online November 14, 2017]. Popul Health Manag. doi: 10.1089/pop.2017.0110. Fronstin P, Roebuck MC. Financial incentives, workplace wellness program participation, and utilization of health care services and spending. EBRI Issue Brief. 2015;(417):1-23. Teeter BS, Braxton-Lloyd K, Armenakis AA, Fox BI, Westrick SC. Adoption of a biometric screening service in community pharmacies: a qualitative study. J Am Pharm Assoc. 2014;54(3):258-266. doi: 10.1331/JAPhA.2014.13203.